We loved this rug. It is so pretty in the space. 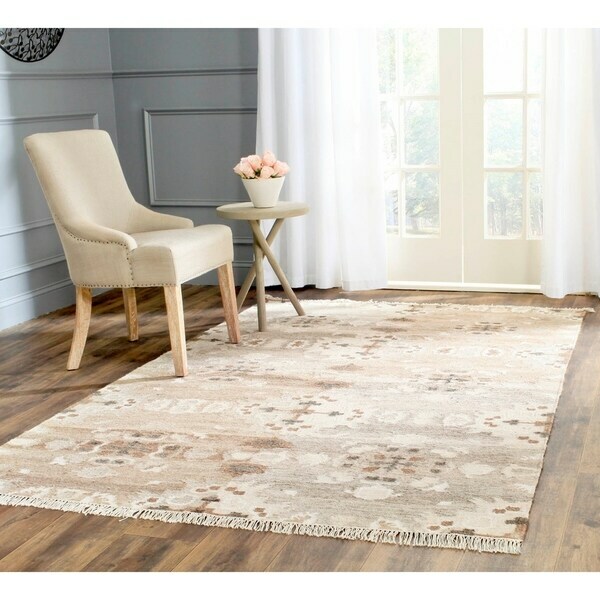 Bring a Southwestern flair to any room in your home with this beautiful wool rug. Constructed of hand-woven wool, this fantastic rug features a low pile height offering comfort while providing protection for your floor surface. The gorgeous grey geometric pattern design is eye-catching and stunning. It allows you to easily incorporate this wonderful wool rug into any decor style. The colors of the rug are muted but a little less so than appeared on my computer screen. The primary material is listed as wool, but the tag says it's wool, cotton, and viscose. Also, the listing says the pile is 1/4" thick, but actually it's quite flat. Despite these slight inconsistencies in the description, I think it's a very nice rug and I'm happy with it. This rug is more beautiful than it appears on my computer screen. The colors are softly muted, yet the design is still distinct and the ivory is lighter and prettier than it appears in the photo. I really like that the ivory is not yellow-toned. The colors are a nice mix of off-white ivory, grey, and brown. If one is looking for plush and soft, this is not your rug, but I wanted a flat-woven rug and this is it. It is thin, but not cheap, just flat thin. It is not soft, but a little rough to the touch so it isn't for lounging around on. Again, that isn't what I wanted so it works great for me. We ordered this rug for our family and have two dogs and kids and it has held up well and has been cleaned a few times. It is not wool as I expected but is 100% viscose, a natural fiber and made in Belgium. It is very nice and we ordered a smaller one of the same to be in another part of the room. I recommend this rug. This rug is beautiful and was a great price. It matches my decor. I hope the colors are true to the photo. "Does this rug contain latex? Thank you"
Hello lydia, this lovely rug does not contain latex. Thank you for shopping with us.